Hyannis Mets third baseman Dan Kantrovitz celebrates a run scored versus Wareham in game two of the Cape League semifinals. The rough and tumble Hyannis Mets were the talk of the Cape League this week, as head coach Tom O'Connell's crew swept through Wareham in the West Division playoffs behind the strong pitching of Charleston South's Matt Coenan in game one and Baylor's Justin Taylor in game two. While Coenan had proved to be O'Connell's go-to starter this summer (5-0, 1.99 ERA) and did not let the Cape League Manager of the Year down in game one at Spillane Field, it was Taylor who amazed the 1,000-plus fans at McKeon Field in game two as the sophomore went the distance and struck out 10 to clinch the West Division Playoff Title. And while Mets' fans may have received a bonus in Taylor's nine-inning shutout of the Gatemen, logic would have it that top Cape League hitters Brendan Harris (William & Mary) and Brian Stavisky (Notre Dame) would have factored largely in the 4-2 and 9-0 wins. 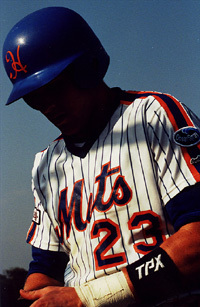 Instead, it was veritable Mets' newcomer Dan Kantrovitz (Brown), designated hitter Mike Rabelo and Matt "Clutch" Carson who went 4-8 in two games with one home run and three RBI to pace the Hyannis offense. Cape League co-pitcher of the year Ben Crockett couldn't foil the hungry Hyannis Mets in game two of the Cape League semifinals. Not to be lost in the playoff and late-season player shuffle, the East Division Regular season champion Brewster Whitecaps staved off a hungry Chatham nine to capture a chance for a league title bid. In game one, Brewster downed the A's, 15-4, behind 17 hits and an eight-run sixth. But the game hadn't always been that way for the East Division regular season champs. A's leadoff man Drew Meyer (South Carolina) got things going quickly at Whitecaps Field, driving pitcher Chad Clark's first offering into the cheap seats and a quick, 1-0 lead. By the time the A's had finished that inning, it was 3-0. But Notre Dame all-star backstop Paul O'Toole (4-5, two RBI), Jack Headley (3 hits) and league batting champ Steve Stanley would have none of it. By the time Brewster was done, Clark dodged enough Chatham bullets to survive and the Whitecaps plated 15 runs. 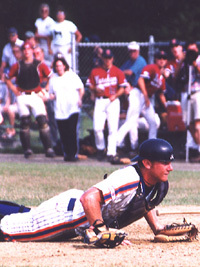 Hyannis Mets catcher Kenny Riley awaits the umpire's call on this close play at the plate versus Wareham. Riley held onto Brian Stavisky's throw from right field and helped stave off a Wareham rally. In game two at Veterans Park, however, Fairfield University ace Dan Krines put the clamp down on the usually hot Whitecaps lumber, going the distance for a 5-1 victory. 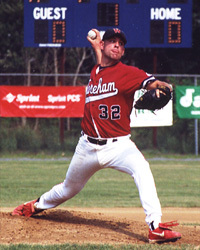 The big run producer on the day for Chatham was first baseman John Kubachka (eastern Connecticut) who muscled an inside pitch into left to drive in two runs in the late innings. With all on the line, though, Stanford's Ryan Gloger took his turn for the Whitecaps and made the most of it, shutting out the A's, 3-0, to head to the League title series versus Hyannis. The tough luck loser in the tightly contested match-up was Princeton's Chris Young who allowed just two hits on the day, but had to suffer two costly team errors. Hyannis Mets field manager Tom O'Connell was named Manager of the Year this week, after a league-wide consenus O'Connell had gotten the job done in reviving a perennial cellar club. O'Connell, a Braintree native, was head coach at Brandeis through the mid-1980s before heading off to Princeton until his retirement two years ago. The Mets ' postseason appearance this summer was the team's first in seven years. Brewster Whitecaps leadoff hitter and East Division All-Star Steve Stanley (Notre Dame) outlasted the competition as the regular season wound down, and ended as the league batting champion and recipient of the Thurman Munson Award. Stanley hit .329 with two extra base hits (51 overall). 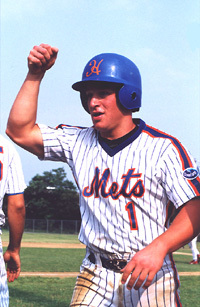 Hyannis Mets' slugger and West Division all-star Brian Stavisky, a teammate of Stanley's at Notre Dame, finished just behind at .324, but had 55 hits all totaled and 26 RBI. Hyannis Mets' second baseman Brendan Harris awaits his turn at bat before lofting a late-inning, two-run double versus Wareham in game two. Unfortunate as it may have seemed, the Whitecaps faired very well under the tutelage of assistant coach Pat Shine (New Mexico). Shine took over this week for Brewster first-year head coach Dave Lawn when Lawn had to depart early or his new job as pitching coach at USC. Boston TV personality Scott Wahle made an impromptu appeance at game two of the Chatham-Brewster series. Wahle offered a fine rendition of "Take Me Out to The Ballgame" during the seventh inning stretch. UNC-Greensboro's top closer Taft Cable garnered the Russ Ford Award this week after Cable was named the Outstanding Relief Pitcher of 2000. Cable was joined as a co-recipient of the award with Brewster's Dan Rich (Stanford). The Hyannis-Brewster series was set to begin today at 3 p.m. at Brewster Whitecaps Field with game two slated for 3 p.m. Sunday at McKeon Field in downtown Hyannis.